Scorpions and snakes and spiders—Oh my! In my first blog post, I wrote about how much I felt I’d changed since my last trip to Thailand—that I’d done a lot of questionably things involving vodka–Red Bull buckets, but I was happy that I didn’t wind up with a dumb Thai bamboo tattoo. I also wrote about how excited I was to return to Thailand, to explore the country’s deeper parts. Within hours of the post going live, my mom emailed me that last sentence, copied and pasted into an otherwise judgmentally blank message. Tattoos offering protection and good fortune have been historic throughout Southeast Asia. In Thailand as well as Cambodia, Laos and Myanmar, traditional sak yant (sacred imagery) tattoos are worn by those working dangerous jobs such as gang members and taxi drivers. Sak yant tattoos are created using a bamboo or metal rod by monks or other shamanistic practitioners. Bamboo tattoos (both sak yant and secular designs) have become increasingly popular with tourists, and backpacker destinations such as Koh Pha Ngan and Koh Phi Phi boast an enormous number of tattoo shops. I didn’t want a sak yant design, though, since I don’t ascribe to the associated belief system (many Thais feel tourists receiving sak yan designs for aesthetic purposes is a religious insult), but I was eager for a bamboo tattoo. 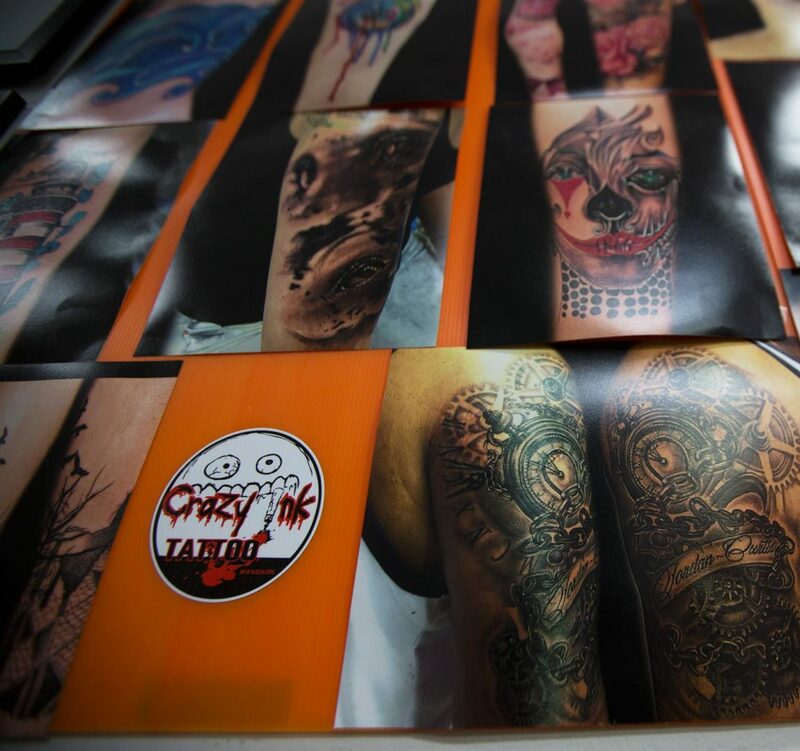 The wall of triumphs at Crazy Ink Tattoo, Khao San Road. So I waited until we were hanging out with a local couple Bangkok. 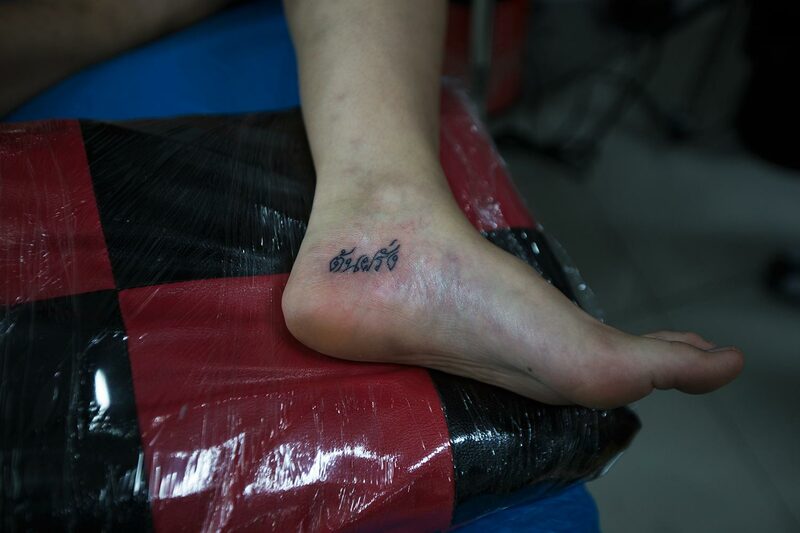 The guy knew of a reputable studio on Khao San Road, called Crazy Ink Tattoo, so we meandered over after dinner. As we neared the studio, I felt the shrimp from my green curry twitch in my stomach. “You don’t have to do this,” said Lena, noticing that I’d blanched to the colour of the tom kha gai (chicken coconut soup) she’d eaten. But, thankfully, the studio looked as clean as any back home, and sanitation certifications adorned the walls. After disinfecting and preparing his station, the tattooist showed me the hermetically sealed bamboo needle (which resembles a drumstick with short metal probes protruding from one end like eyelashes), emphasizing in broken Thaiglish the studio’s strict hygienic practices and that the instrument was new and sterile. Then my new friend explained my desired design, Lena scurried off to grab juice in case my blood sugar dropped and I suddenly fainted, and the process began. “What’s it like?” asked our videographer, wincing behind his camera as my skin sprung up and down with the tapping of the needle. “Less fun than a Thai massage,” I replied. Afterwards, the tattooist removed the metal probes from the bamboo and presented it to me as keepsake (and as further proof that they don’t reuse their materials). I thanked him graciously, then flashed my new ink for John’s camera. My tattoo reads farang, which is basically the Thai word for “gringo.” Hey, what could be more cheekily apt than to get a bamboo tattoo that essentially translates as “stupid tourist” on the backpackeriest street in the world? Update: It turns out Sue’s tattoo does not, in fact, say “farang,” but actually “guava tree,” because of a miscommunication between the man helping to translate and the woman working at the tattoo shop. Frankly, we think that’s even better. I guess you’ve enjoyed your tattoo experience in Thailand. Yes, indeed Sak Yant Tattoo is very popular and sacred too.